I'm sure that most of you will have seen VIC REEVES' & BOB MORTIMER's version of classic TV show RANDALL & HOPKIRK (DECEASED). I recalled the first episode years after the fact - then I watched it again on DVD and was surprised to see DAVID TENNANT playing a prominent role. Why didn't I recognise him when I saw him in CASANOVA and Doctor Who? So, is there something you thought you remembered long after the fact, only to find on re-encountering it that there was an element of it you'd forgotten - but shouldn't have? Do tell. It doesn't have to be about actors or TV shows - anything's fair game. For an artist, i really have a terrible perception of human faces. I mean, really bad. Last year i watched the run of How I Met Your Mother. I was in season 8 before i finally realized that Robin, the Who-I-Really-Wanted-Instead-Of-Your-Mother girl was frelling Maria Hill, second in command of SHIELD in the Marvel movies. In day to day life, i tend to recognize people more by the way they move and other such cues reinforcing basic appearance. And, or course, context - as you point out - is so terribly helpful. I imagine in my case, 3, with Roger Moore, Peter Purves, and David Tennant (and there are others no doubt), that because I didn't know who they were when I first saw them in a TV show, there was no recognition factor carrying over when I saw them again. It was only because I knew them from their later shows that I was surprised I hadn't remembered them from their earlier ones when I saw them again. (Though, with the first two, I was still just a kid.) It just doesn't always seem to happen the same way in reverse, does it? Surprisingly, nowadays I've usually got a good memory for faces, which is just as well as my shaving mirror is broken. Thinking of The Saint TV shows and reoccurring actors, Warren Mitchell who became famous with the Alf Garnett role in Till Death Us Do Part had been a Rome(?) Taxi driver over a number of years on The Saint. He had been all over TV before becoming anything other than a supporting actor. If I remember rightly, T47 (I'd have to check), he played the taxi driver in the very first episode. (Update: Just checked - it was the second episode - The Latin Touch.) I can't recall precisely how many times he played the part (just checked - three times that I can see in the credits), but I remember (when watching DVDs of the series a few years back) being surprised when another actor turned up in the role, presumably because of Warren's then-success as Alf Garnett. I watched the films 300 and Dredd, and the TV show Game of Thrones, without realising that they all had the same woman in prominent roles - Lena Headey. There have been other moments when I thought 'wow, I didn't remember that person was in it'... but I can't remember them. The only one that comes to mind is that Chris Evans (the Johnny Storm/Captain America one, not the ginger speccy one) was in the so-so spoof 'Not Another Teen Movie'. Taxi drivers used to turn up frequently as plot devices in Charteris stories. Thanks for checking the credits, you're obviously a fan. I'm relying on memory of the 60's. Didn't go through the episodes, T47, simply read the back of the DVD cases in my boxed set. I'm far too lazy to trawl through the actual TV show credits. You own the DVD Boxed Set. Makes you a fan. Maybe you can answer this as I didn't have colour TV then. The series that started in 1966-67 may have been in colour for the US market. In the first few episodes shown in 1966 the then new revolving NEW SCOTLAND YARD sign was shown, this was before Scotland Yard had officially moved into that building. I understand that the 50 year lease on that building has now expired and NEW SCOTLAND YARD has moved back to the complex on the Embankment. Another episode showed a headstone in a cemetery with the date of the deceased death as 1967 when it was still 1966. Ivor Dean as Inspector Claude Eustace Teal was a great foil for Moore. I think at one point they tried giving him as Teal his own show? I only bought the DVD boxed set yesterday, actually, and while I certainly enjoy The Saint episodes, the word 'fan' denotes a rather more 'invested' interest than I consider myself having as regards the show. I buy most of these things out of nostalgia for my own past, and Roger Moore's Saint was part of that. Don't know anything about the lease expiring on the NSY building, but the first two series were in b&w, before switching to colour for subsequent series. I assume (in the instance you refer to) that the producers set the episode in the year it was due to be (initially) broadcast (especially abroad) to make it seem 'current', but probably not every TV series did that. Don't know anything about the possibility of Teal's own show, but Ivor Dean played the exact same kind of policeman (though with a different name) in Randall & Hopkirk (Deceased). Hard to believe that he was younger than I am now when he died. There was a sergeant who was my NCOIC (i.e., supervisor) in the Army, and the first time I saw her off-duty and in civilian clothes, and with her hair down to her shoulders instead of pinned up, I didn't recognize her until she said hello. With actors who played diverse parts, it may be easy to forget that the guy who played the superhero in The Adventures of Captain Marvel also played the monster in The Mummy's Hand, and a bad guy gunslinger in Stagecoach. Or that the hero in Casablanca was an evil gangster in The Roaring Twenties. And that the good guy detective in The Adventures of Sherlock Holmes was the villain in The Adventures of Robin Hood. A few weeks ago, I watched a video of an old Dave Allen comedy show on Youtube. He was talking about how people get tongue-tied when they meet a celebrity in person. "You're my biggest fan. I mean, I'm your favorite star. I mean..." And, "I watch your show on the telephone." Re the latter gag, someone commented, "Dave Allen was prescient." Then I realized the irony. I was watching the video on a cell phone. Ah, Dave Allen. Very funny guy, TC, and his comedy sketches were good too. 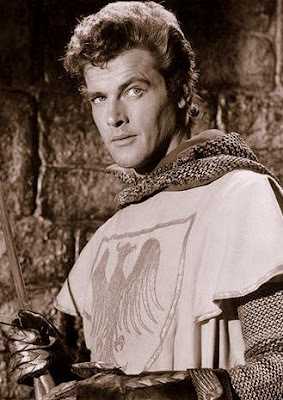 I suppose when I was a kid, I couldn't have been paying attention to who the lead actors were, which is the only reason I can think of for not saying "Hey, that's Ivanhoe!" when I first saw The Saint. I wonder if I even realized (I must've surely, but couldn't swear to it) that Peter Purves wasn't William Russell when I first saw PP on Dr. Who. After all, they were playing similar type roles in that very British style of acting which was prominent at the time. I used to watch Corky the Circus Boy when I was a kid, but I never realised that the same actor was one of The Monkees when I saw him later. True, he was using the name of Micky Dolenz instead of Mickey Braddock and was years older, but you'd think I'd have spotted it was the same guy. Nope.